La Liga champions Barcelona and English heavyweights Manchester United are set to battle it out in the UEFA Champions League quarter-final second leg at the Camp Nou tonight. 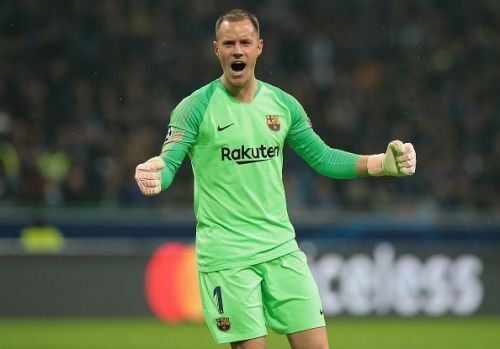 Barca goalkeeper Marc-Andre ter Stegen was in an upbeat mood during the pre-match press conference, appearing very confident about his side overcoming the Red Devils. Barcelona haven't progressed past the quarter-final stage of the UEFA Champions League for the past three seasons, and the pressure is immense on manager Ernesto Valverde to deliver in Europe this season. The Spanish champions are 9 points clear at the top of the La Liga table, with only 6 games to go. Barcelona carry a 1-goal advantage from the first leg, owing to a Luke Shaw own-goal at Old Trafford. The Blaugrana cannot afford to take Manchester United for granted, especially considering the kind of fight and desire they showed to overcome a 2-0 first leg deficit to Paris Saint-Germain with a 3-1 victory in Paris in the Round of 16. During the pre-match presser, Ter Stegen was quick to remark that Barcelona are a different proposition than PSG, and that he expects his side to confidently progress past United into the semi-finals. "We are different from Paris Saint-Germain. We will see that tomorrow, but the good thing is that we play different from PSG. The result is dangerous because the advantage is small but we know we have to keep the ball, as always, and play as we always do in order to achieve the best result. “We have a rival who wants to win, a team who have won important away matches this season and, of course, the advantage we have is not very big but we want to defend it, we want to show that we are superior." The Barcelona No.1 was also quick to allay any fears fans have that there might be a repeat of the Roma debacle of last season, when the Blaugrana capitulated in Rome 3-0, after having dominated the home leg 4-1, to get knocked out in the quarter-finals. Barcelona are eyeing another treble this season, having already booked their place in the Copa del Rey final.